As part of the Darlington Upgrade project, Main South Road, Bedford Park, and part of the Southern Expressway will be temporarily closed from 8pm, Friday, 24 August until 6am, Monday, 27 August. This closure will allow for the installation of the 3,000 tonne bridge which will be located on Main South Road over the Southern Expressway to the new lowered motorway. Main South Road will be closed between Flinders Drive and Flagstaff Road. Detours will be in place via Sturt Road and Marion Road. The Southern Expressway will be closed between the Marion Road off ramp and Main South Road intersection. 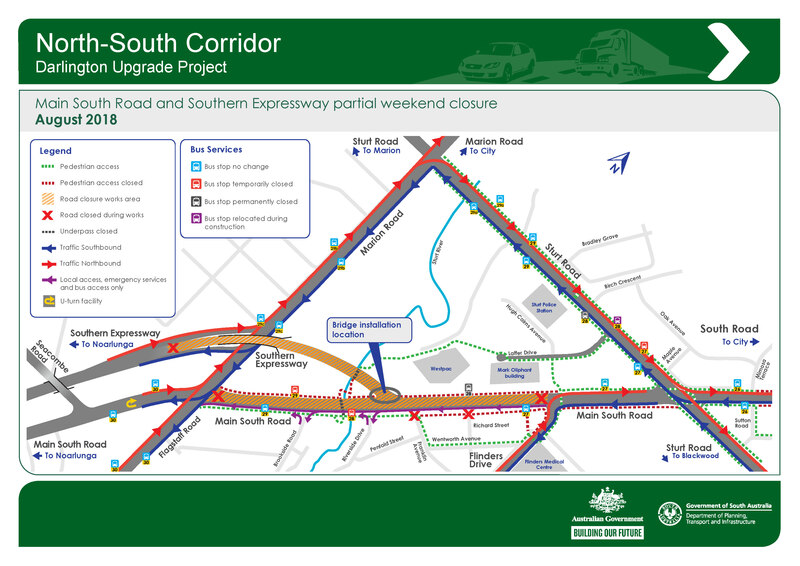 Motorists will be required to enter/exit the Southern Expressway via the Marion Road ramps. Access for emergency vehicles in all directions will be maintained at all times. The lowered motorway will be open to traffic on completion of the project. We thank motorists for their patience while these important works are undertaken.